From now on, visitors can explore Piran's legends using the free - to - use application Nexto, which leads you through the town in a playful way using quizzes, riddles and challenges. A new way to tour the town! Should you solve all the challenges, make sure to visit the Tourist Information Office in Piran to collect a small reward for your effort and new knowledge. 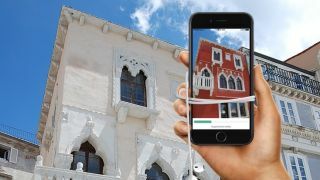 A free mobile app will lead you around the key sights and attractions in Piran. Learn about historical characters, solve riddles, unlock virtual souvenirs, 3D artefacts and go into the past using virtual reality. There are six challenges waiting: The Devilish Tartini, Poisonous Tongues, The Shield of Piran, Fire and Water, The Portal Through History and The Heart of Piran. Add some activity to your vacation using this virtual guide and discover our cultural heritage. Learn about Piran with the free interactive application Nexto.